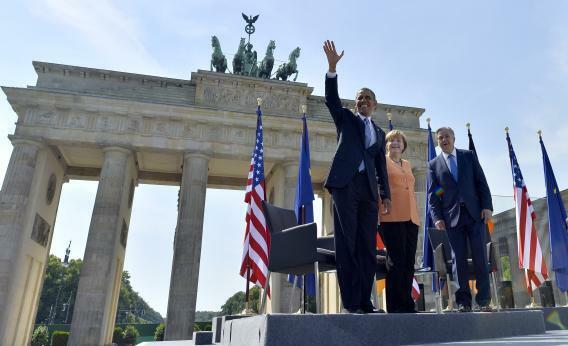 Obama administration's indifference on NSA surveillance fuels fury in Europe. For almost a month, revelations about the National Security Agency’s surveillance programs have made headlines across the world. But the international legal and political backlash is only just beginning. In June, details about the NSA’s efforts to spy on foreigners’ communications sparked outrage in Europe, prompting calls for renewed efforts to strengthen data protections regulations. Now, the rhetoric is being replaced with action. Following the exposure of the NSA’s Internet snooping system PRISM, the vice president of the European Commission, the EU’s executive body, squared up to Attorney General Eric Holder over the scope of the program. Further information published by the Guardian on Sunday revealed that the NSA is not only monitoring foreigners for intelligence-gathering and counter-terrorism purposes, but it is also bugging diplomatic missions used by EU officials. This has prompted France to threaten to halt European trade talks unless the United States “immediately” stops its surveillance of allies, potentially jeopardizing a free-trade agreement worth billions of dollars every year. In Germany, a country with a touchy relationship with privacy due to the brutal legacy of East Germany’s Stasi secret police, revelations about the NSA explicitly targeting Germans’ communications for mass surveillance have incensed both the public and political class alike. A spokesman for German Chancellor Angela Merkel said that “bugging friends is unacceptable” and added that “we are no longer in the cold war.” German newspaper Der Spiegel reported Sunday that federal prosecutors in the country are investigating the NSA’s spying and that criminal complaints will likely be issued in relation to the scandal. Elsewhere, government officials in Luxemburg, Austria, Turkey, and Japan have demanded answers from the Obama administration about the NSA’s spying efforts. And U.N. Secretary General Ban Ki-moon said Monday when asked about the U.S. bugging diplomatic missions that international law means “diplomatic activities should be protected.” Indeed, the 1961 Vienna convention on diplomatic relations specifically states that “the official correspondence of the mission shall be inviolable.” But that does not appear to have stopped the NSA, which reportedly deemed 38 embassies and missions “targets” for covert communications surveillance. The classified documents leaked by NSA contractor Edward Snowden continue to illustrate how the agency has spread its surveillance tentacles around the world. It is possible, however, that the forced transparency Snowden has brought about with his leaks may lead to a culture-shift in the NSA’s activities. Public opinion on the NSA’s spying is divided in the United States. But international legal cases and mushrooming diplomatic fallouts in Europe and elsewhere could make the difference—reining in aggressive surveillance programs that appear to have spiralled to alarming proportions under cover of total secrecy.